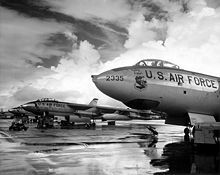 Picture - Boeing B-47E-65-BW (AF Serial No. 51-5257) during a test of the rocket-assisted take-off system. The Boeing Model 450 B-47 Stratojet was a long-range, six-engined, jet-powered medium bomber built to fly at high subsonic speeds and at high altitudes. It was primarily designed to drop nuclear bombs on the Soviet Union. With its engines carried in pods under the swept wing, the B-47 was a major innovation in post-World War II combat jet design, and helped lead to modern jet airliners. The B-47 entered service with the United States Air Force's Strategic Air Command (SAC) in 1951. It never saw combat as a bomber, but was a mainstay of SAC's bomber strength during the 1950s and early 1960s, and remained in use as a bomber until 1965. It was also adapted to a number of other missions, including photo reconnaissance, electronic intelligence and weather reconnaissance, remaining in service as a reconnaissance platform until 1969 and as a testbed until 1977. The B-47 arose from an informal 1943 requirement for a jet-powered reconnaissance bomber, drawn up by the U.S. Army Air Forces (USAAF) to prompt manufacturers to start research into jet bombers. Boeing was among several companies that responded to this request; its initial design, the Model 424, was basically a scaled-down version of the piston-engined Boeing B-29 Superfortress equipped with four jet engines. The next year, this concept evolved into a formal request-for-proposal to design a new bomber with a maximum speed of 550 mph (800 km/h), a cruise speed of 450 mph (725 km/h), a range of 3,500 mi (5,600 km) and a service ceiling of 45,000 ft (13,700 m). North American Aviation, the Convair Corp., Boeing and the Glenn Martin Company submitted proposals for the new long-range jet bomber in December 1944. Wind tunnel testing had shown that the drag from the engine installation of the Model 432 was too high, so Boeing engineers then tried a revised design, the Model 432, with the four engines buried in the forward fuselage. The USAAF awarded study contracts to all four companies, requiring that North American and Martin concentrate on four-engined designs, (to become North American B-45 and Martin XB-48), while Boeing and Convair were to build six-engined aircraft (the B-47 and B-46). The powerplant was to be General Electric's new TG-180 turbojet engine. In mid-1945, with the defeat of Germany immiment, the von Kx�rmx�n mission of the Army Air Forces inspected German aeronautics laboratories from the beginning of May through the end of July 1945, in search of German developments that might help the United States. One of the Boeing engineers on the mission, George Schairer, studied German reports on the effects of wing sweepback on the performance of aircraft as they approached the speed of sound, and realizing the possible implications for the new bomber, sent word back to Boeing to stop work on the straight-winged design and switch to swept wings. Analysis work by the Boeing engineer Vic Ganzer suggested an optimum sweepback angle of about 35 degrees. Boeing's aeronautical engineers modified their Model 432 design to include swept wings and tail, resulting in the "Model 448", which was presented to the USAAF in September 1945. The Model 448 retained its four TG-180 jet engines in its forward fuselage, with two more TG-180s in the rear fuselage. The flush-mounted air intakes for the rear engines were inadequate, while the USAAF disliked the installation of engines within the fuselage, considering it a fire hazard. The engines were moved out to streamlined pods pylon mounted under the wings, leading to the next iteration, the Model 450, which featured two TG-180s in a twin pod mounted on a pylon about a third of the way outboard on each wing, plus another engine at each wingtip. The Army Air Force liked this new configuration, and so Boeing's team of engineers continued to refine it, with the outer engines being moved further inboard, to about 3/4 of the wingspan. The thin wings provided no room into which wheels could be retracted, so a "bicycle landing gear" was chosen, with the two main gear assemblies arranged in a tandem configuration and outrigger struts fitted to the inboard engine pods. As the landing gear arrangement made rotation (i.e. lifting the nose during take-off) impossible, the landing gear was designed so that the aircraft rested on the ground at the proper angle for take-off. The USAAF was very pleased with the refined Model 450 design, and in April 1946, the service ordered two prototypes, to be designated "XB-47". Assembly began in June 1947. People involved with the project were very excited, since they believed (correctly as it turned out) they were working on a breakthrough in aircraft design. The first XB-47 was rolled out on 12 September 1947, a few days before the USAAF became a separate service, the U.S. Air Force on 18 September 1947. The XB-47 prototype flew its first flight on 17 December 1947 (the anniversary of the Wright Brothers' first four flights on December 17, 1903), with the test pilots Robert Robbins and Scott Osler at the controls of the airplane. It flew from Boeing Field in Seattle to the Moses Lake Airfield in central Washington state, in a flight that lasted just 27 minutes, with no major problems. Robbins had to pull up the flaps with the emergency hydraulic system, and the "engine fire" warning lights kept lighting up. Robbins reported that the flight characteristics of the aircraft were good. During early tests of the XB-47 prototype, the canopy came off at high speed, killing pilot Scott Osler. The copilot safely landed the aircraft. This resulted in a canopy redesign, and the hiring of pilot Tex Johnston. The second XB-47 prototype first took the air on 21 July 1948, and was equipped with much more powerful General Electric J47-GE-3 turbojets with 5,200 lbf (23 kN) thrust each. The J47 or "TG-190" was a redesigned version of the TG-180/J35. The first XB-47 prototype was later retrofitted with these engines. Flight testing of the prototypes was particularly careful and methodical, since the design was so new in many ways. The prototypes initially suffered from "Dutch roll", an instability that caused the aircraft to weave in widening "S" turns. This problem was remedied by the addition of a "yaw damper" control system that applied rudder automatically to damp out the weaving motion. The prototypes also had a tendency to pitch up. This problem was solved by adding small vanes called "vortex generators" onto the wings that caused turbulence to prevent airflow separation. Boeing test pilot Rob Robbins had originally been skeptical about the XB-47, saying that before the initial flight he had "prayed to God to please help me" through the flight. The aircraft was so unusual that he simply didn't know if it would fly. Robbins soon realized that he had an extraordinary aircraft. At that point, Chuck called me on the radio and said: "Bob, would you do a 180?" I thought, Hey, Chuck's smart, he just wants to stay reasonably close to Moses Lake, he doesn't have as much fuel as I do. Well, I turned around, got stabilized, and looked for Chuck. He wasn't there. Finally, I got on the radio and said, "Chuck, where are you?" He called back and rather sheepishly said, "I can't keep up with you, Bob." So Chuck Yeager had to admit to a civilian test pilot flying a bomber that he couldn't keep up! That was something! Yeager would test-fly the XB-47 later in its development cycle and would years later note that the aircraft was so aerodynamically clean that he had difficulty putting it down on the runway. By mid-1948, the Air Force's bomber competition had already been through one iteration, pitting the North American XB-45 against the Convair XB-46. The North American design won that round of the competition, and as an interim measure the USAF had decided to put the North American bomber into production on a limited basis as the B-45 Tornado. The expectation was that B-45 production would be terminated if either of the remaining two designs in the competition, the Boeing XB-47 and the Martin XB-48, proved superior. It is sometimes claimed that the final production decision was made as a result of Boeing president Bill Allen inviting USAF General K.B. Wolfe, in charge of bomber production, for a ride on the XB-47. A formal contract for 10 aircraft was signed on 3 September 1948. The XB-47, which looked unlike any contemporary bomber, was described by some observers as a "sleek, beautiful outcome that was highly advanced". The 35-degree swept wings were shoulder-mounted, with the twin inboard turbojet engines mounted in neat pods, and the outboard engines tacked under the wings short of the wingtips. With the exception of a change from the shoulder-mounted wing configuration to being under the fuselage, most future airliners would use a similar configuration, with the engines mounted in underwing pylons. The airfoil was 11 times as wide as it was thick. This unusual thinness (dry, no fuel tanks) was believed to be necessary to attain high speed (0.86 Mach), but the wing's flexibility was a concern. It could flex as much as 5 ft (1.5 m) up or down, and major effort was expended to ensure that flight control could be maintained as the wing moved up and down. As it turned out, most of the worries proved unfounded. (Wing "twist" limited tree-top speed to 425 knots (787 km/h) to avoid control reversal.) The wings were fitted with a set of Fowler flaps that extended well behind the wing, to enhance lift at slow speeds. The XB-47 was designed to carry a crew of three in a pressurized forward compartment: a pilot and copilot, in tandem, in a long fighter-style bubble canopy, and a navigator in a compartment in the nose. The copilot doubled as tail gunner, and the navigator as bombardier. The bubble canopy could pitch up and slide backward, but as the cockpit was high off the ground, crew entrance was through a door and ladder on the underside of the nose. The first prototypes were fitted with General Electric J35 turbojets, the production version of the TG-180, with 3,970 lbf (17.7 kN) of thrust. Early jet engines did not develop good thrust at low speeds, so to help a heavily loaded bomber take off, the XB-47 prototype had provisions for fitting 18 solid-fuel rocket-assisted takeoff (RATO) rockets with 1,000 lbf (4.4 kN) thrust each. Fittings for nine such units were built into each side of the rear fuselage, arranged in three rows of three bottles. The performance of the Model 450 design was projected to be so good that the bomber would be as fast as fighters then on the drawing board, and so the only defensive armament was to be a tail turret with two .50 in (12.7 mm) Browning machine guns, which would in principle be directed by an automatic fire-control system. The two XB-47s were not fitted with the tail turret as they were engineering and flight test aircraft; indeed, the prototypes had no combat equipment at all. Fuel capacity was enormous, at 17,000 gal (64,400 l), more than triple the 5,000 gal (19,000 l) on the B-29 Superfortress. That meant that maintaining fuel trim to ensure a stable center of gravity in flight would be a very critical copilot duty. The total bombload capacity was to be 10,000 lb (4.5 metric tons). Production aircraft were to be equipped with state-of-the-art electronics for navigation, bombing, countermeasures, and turret fire control. A related problem was that the aircraft's engines would have to be throttled down on landing approach. 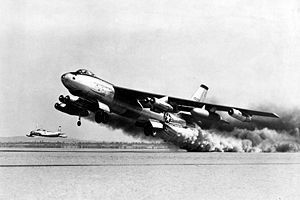 Since it could take as long as 20 seconds to throttle them back up to full power, the big bomber could not easily do a "touch and go" momentary landing. A small "approach chute" was provided for drag so that the aircraft could be flown at approach speeds with the engines throttled at ready-to-spool-up medium power. Training typically included an hour of dragging this chute around the landing pattern for multiple practice landings. The aircraft was so aerodynamically slick that rapid descent ("penetration") from high cruise altitude to the landing pattern required dragging the deployed rear landing gear. Unusually heavy wing loading (weight/wing area) required a high landing speed of 180 knots (330 km/h). To shorten the landing roll, Air Force test pilot Major Guy Townsend promoted the addition of a 32 ft (9.75 m) German-designed "ribbon" drag chute. (Jet engine thrust reversers were still a "far-future" concept.). As a consequence, the B-47 was the first mass-produced aircraft to be equipped with an anti-skid braking system. When B-47s began to be delivered to the Air Force, most crews were excited about getting their hands on the hot new bomber, an aircraft whose performance was closer to that of jet fighters of the period than SAC's extant B-36 Peacemaker bomber. The B-47 was so fast that in the early days the aircraft set records with ease. The aircraft handled well in flight, with a fighter-like light touch to the controls. The large bubble canopy for the pilot and co-pilot enhanced the fighter-like feel of the aircraft with improved vision, but the design would also cause variations in internal temperatures for the three-man crew. It took the Air Force until 1953 to turn the B-47 into an operational aircraft. The aircraft was sluggish on takeoff and too fast on landings, a very unpleasant combination. If the pilot landed at the wrong angle, the aircraft would "porpoise", bouncing fore-and-aft. If the pilot didn't lift off for another go-round, instability would quickly cause the bomber to skid onto one wing and cartwheel. Because the wings and surfaces were flexible and bent in flight, low altitude speed restrictions were necessary to ensure effective flight control. Improved training led to a good safety record, and few crews felt the aircraft was unsafe or too demanding, but apparently there were some aircrews who had little affection for the B-47. Crew workload was high, with only three officer crew members to keep the B-47 flying right. The B-52 Stratofortress, in contrast, generally had six crewmen, 5 officers and 1 enlisted, with far more internal cabin space. 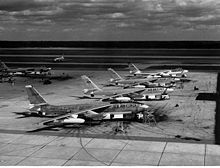 The B-47's reliability and serviceability were regarded as good. The only major problem was poor avionics reliability, normal in this environment given the vacuum tube technology at the time, and the need to place some equipment outside the pressurized crew compartment. Much work was done to improve avionics reliability, but they remained problematic throughout the B-47's operational life. Several models of the B-47 starting in 1950 included a fuel tank inerting system, in which dry ice was sublimated into carbon dioxide vapor while the fuel pumps operated or while the in-flight refueling system was in use. The carbon dioxide was then pumped into the fuel tanks and the rest of the fuel system, ensuring that the amount of oxygen in the fuel system was low, and thereby reducing the probability of an explosion. Ten carbon dioxide tanks and heaters were involved. The system was implemented largely to reduce risks from static electricity discharges occurring during in-flight refueling. Initial mission profiles included the loft bombing (Low Altitude Bombing System) of nuclear weapons. As the training for this imposes repeated high stress on the aircraft, the airframe lifetime would have been severely limited by metal fatigue, and this maneuver was eliminated. By 1956, the U.S. Air Force had 28 wings of B-47 bombers and five wings of RB-47 reconnaissance aircraft. The bombers were the first line of America's strategic nuclear deterrent, often operating from forward bases in the UK, Morocco, Spain, Alaska, Greenland and Guam. B-47 bombers were often set up on "one-third" alert, with a third of the operational aircraft available sitting on hardstands or an alert ramp adjacent to the runway, loaded with fuel and nuclear weapons, crews on standby, ready to attack the USSR at short notice. Crews were also trained to perform "minimum interval takeoffs (MITO)", with one bomber following the other into the air at intervals of as little as 15 seconds, to launch all bombers as fast as possible. MITO could be hazardous, as the bombers left turbulence and, with first generation turbojet engines with water injection systems, dense black smoke that blinded pilots in the following aircraft. B-47 bombers apparently performed training missions in which they penetrated Soviet airspace in numbers. The B-47 would be the backbone of SAC into 1959, when the B-52 began to assume nuclear alert duties and the number of B-47 bomber wings started to be reduced. B-47 production ceased in 1957, though modifications and rebuilds continued after that. Operational practice for B-47 bomber operations during this time went from high altitude bombing to low altitude strike, which was judged more likely to penetrate Soviet defenses. Bomber crews were trained in "pop-up" attacks, coming in at low level at 425 knots (787 km/h) and then climbing abruptly near the target before releasing a nuclear weapon, and the similar "toss bombing" procedure, in which the aircraft released the weapon while climbing, and then rolled away to depart the area before bomb detonation. Strategic operations of the 2,000 B-47s required 800 KC-97 Stratotankers. Stress and fatigue incurred in low-altitude operations led to a number of wing failures and crashes and an extensive refit program was begun in 1958 to strengthen the wing mountings. The program was known as "Milk Bottle", named after the big connecting pins that were replaced in the wing roots. One of the more notable mishaps involving a B-47 occurred on 5 February 1958 near Savannah, Georgia, in the so-called 1958 Tybee Island B-47 crash. A B-47 based out of Homestead AFB, Florida was engaged in a simulated combat exercise with an F-86 Sabre, the bomber simulating an attacking aircraft and the fighter a defender. As was the practice at the time, the B-47 was carrying a single 7,600 lb (3,400 kg) Mark 15 nuclear bomb without its core. During this exercise, the F-86 collided with the B-47. The F-86 pilot ejected and the fighter crashed, while the B-47 suffered substantial damage, including loss of power on one of its outboard jet engines. The bomber pilot had to "safe" soft drop the Mark 15 weapon off the coast of Savannah, Georgia near Tybee Island after three unsuccessful landing attempts at Hunter Air Force Base. The bomb was jettisoned and the aircraft landed safely. An extensive nine-month search was mounted for the unarmed bomb, but proved futile. 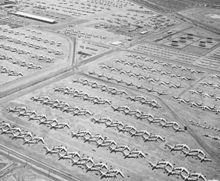 Picture - Retired B-47s at Davis-Monthan Air Force Base in the 1960s. Final phaseout of B-47 bomber wings began in 1963, and the last bombers were out of service by 1965. The very last USAF operational aircraft was grounded in 1969. The U.S. Navy kept specialized B-47 test aircraft in occasional use up to 1976. The final recorded flight of a B-47 was on 17 June 1986, when a B-47E was flown from the Naval Air Weapons Station China Lake, California, to Castle Air Force Base, California, for static display at the Castle Air Museum. The only B-47s to see anything that resembled combat were the aerial reconnaissance variants. The first overflight of Soviet territory with an RB-47 took place on 15 October 1952, when an RB-47B flying out of Alaska overflew Soviet airfields in Eastern Siberia. RB-47s operated from almost every airfield that gave them access to the USSR, and they often probed Soviet airspace, and on occasion, their pilots were caught in situations from which mostly speed and evasion in retreat saved them. At least five of these aircraft were fired on, and three of these were shot down. The RB-47s fired back with their tail turrets, although it is uncertain if they scored any kills, nonetheless, these were the only shots fired in anger by any B-47. On 8 May 1954, after a top secret reconnaissance mission in the Kola Peninsula, a 4th Air Division 91 Strategic Reconnaissance Wing RB-47E reconnaissance aircraft, with Hal Austin at the controls, flew west from the Soviet Union. The RB-47E was flying at high altitude, out of reach of MiG-15s, but unknown to USAF intelligence some MiG-17s had been stationed in the area that were able to intercept the intruder. The RB-47E was chased by three Soviet MiG-17 fighters attempting to destroy the aircraft with their guns over Soviet and Finnish airspace. Although sustaining damage, the RB-47E managed to escape over Sweden back to its home base at RAF Fairford, Gloucestershire. Its top speed and combat radius superior to the Soviet fighter jets, were the deciding factors. The mission marked the first instance in which a jet aircraft equipped with modern photography equipment was used for American military reconnaissance. The incident was kept secret by all parties. Other interceptions resulted in losses. A RB-47 flying out of Alaska was scouting out the Kamchatka Peninsula on 17 April 1955, when it was bounced by Soviet MiG-15s in international airspace. The RB-47 and its crew disappeared. Between 21 March and 10 May 1956, 16 RB-47Es and 5 RB-47Hs operating from Thule performed overflights the length of Siberia 156 times under Project HOMERUN. The Soviets filed an angry complaint with the US government, which attributed the overflights to "navigational difficulties". MiGs did bounce RB-47s on three separate occasions in the fall of 1958, with one incident over the Black Sea on 31 October, the second over the Baltic on 7 November, and the third over the Sea of Japan on 17 November. On 1 July 1960, a PVO Strany MiG-19 shot down an RB-47H (AF Serial No. 53-4281) reconnaissance aircraft in the international airspace over the Barents Sea with four of the crew killed and two captured by the Soviets but released in 1961. The co-pilot reported that the MiG-19 jammed ("whited-out") his MD-4 FCS scope rendering the RB-47H defenseless. The last known confrontation between MiGs and RB-47s took place on 27 April 1965, when an ERB-47H was jumped by North Korean MiG-17s over the Sea of Japan. The MiGs made hits on the aircraft, but the ERB-47H managed to make it back to Yokota Air Base in Japan with two engines out. The final 15 RB-47Es built beginning in December 1955, were fitted with additional equipment, including the AN/APD "side looking airborne radar (SLAR)" system, and gear to sample the air for fallout from nuclear tests. These last examples were given the new designation of RB-47K. The RB-47Ks were generally used for weather reconnaissance missions, carrying a load of eight "dropsonde" weather sensors that were released at various checkpoints along the aircraft's flight path. Data radioed back from the dropsondes was logged using equipment operated by the navigator. The RB-47Ks stayed in service until 1963. Section source: Baugher. XB-47 Two prototype aircraft. Two built as Model 450-1-1 and 450-2-2 respectively,(46-065 and 46-066). Powered by six Allison J-35-GE-7 turbojet engines for the first flights. The second, and subsequent, aircraft were built with the specified General Electric J-47-GE-3 engines, which were retro-fitted to the first XB-47. B-47A B-47A Stratojet, described by the press as the "fastest bomber in the world" flies near the Boeing Aircraft Co. production plant in Wichita, Kansas, 11 August 1950 The first 10 aircraft were designated "B-47A", and were strictly evaluation aircraft. The first was delivered in December 1950. The configuration of the B-47As was close to that of the initial XB-47 prototypes. They were fitted with J47-GE-11 turbojets, offering the same 5,200 lbf (23 kN) thrust as the earlier J47-GE-3, and they also featured the built-in RATO bottles. Four of the B-47As were fitted with the K-2 bombing and navigation system (BNS), with an HD-21D autopilot, an analog computer, APS-23 radar, and a Y-4 or Y-4A bombsight. Two were fitted with the tail turret, one of them using an Emerson A-2 fire control system (FCS), another an early version of the General Electric A-5 FCS. The eight other B-47As had no defensive armament. The B-47As were fitted with ejection seats. The pilot and copilot ejected upward, while the navigator had a downward ejection seat built by Stanley Aviation. Minimum safe ejection altitude was about 500 ft (150 m). While the XB-47s had been built by Boeing at their Seattle, Washington, plant, the B-47As and all following Boeing B-47 production were built at a government-owned factory in Wichita, Kansas, where the company had built B-29s in the past. The switch was made as the Seattle plant was burdened with KC-97 Stratotanker production and other urgent tasks. Following a series of preliminary contracts for production B-47s, in November 1949, even before the first flight of the B-47A, the Air Force had ordered 87 B-47Bs, the first operational variant of the type. The first B-47B flew on 26 April 1951. A total of 399 were built, including eight that were assembled by Lockheed and ten that were assembled by Douglas, using Boeing-built parts. The bomb bay of the B-47B was shorter than that of the XB-47 and B-47A, since nuclear weapons had shrunk in the interim. However, the B-47B could carry a much larger bombload, of up to 18,000 lb (8,200 kg). All B-47Bs carried the tail turret with twin 20 mm (0.79 in) guns and the B-4 radar-guided FCS. The B-4 FCS proved troublesome, in fact so troublesome that in some B-47Bs it was replaced with an N-6 optical sight. The copilot could swivel his seat around to face backward and sight the guns directly. 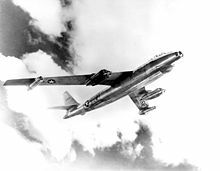 In practice, even the enormous fuel capacity of the B-47 was still not enough to give it the range the Air Force wanted, and in fact there had been substantial prejudice against the type among the senior Air Force leadership because of the limited range of the initial design. Solution of this problem was a high priority, and so an "in-flight refueling (IFR)" receptacle was fitted in the right side of the nose for "boom"-style refueling from KB-50 and KC-97 aircraft. This was the main reason for the deletion of the plexiglas nose cone for the bombardier navigator. The B-47B was also fitted with a pair of jettisonable external tanks, carried between the inboard and outboard engine assemblies. These external drop tanks were very large, with a capacity of 1,780 gal (6,750 l). The B-47B suffered a considerable gain in weight compared to the B-47A, and so as a weight-reduction measure the ejection seats were deleted, and a windbreak panel was fitted to the aircraft's main door to make escapes easier. Some sources also claim that a fatal ejection-seat accident in a B-47A contributed to this decision. Whatever the case, this was not a very popular measure with crews, as getting out of the aircraft even at altitude was troublesome. The Air Force had considered building a specialized RB-47B reconnaissance variant to complement the B-47B bomber version, but as it turned out schedule slips and the like ensured that the RB-47E was the first production reconnaissance variant. As an interim measure before the RB-47E went into service, 24 B-47B bombers were fitted with a heated pod with eight cameras that was stowed in the forward bomb bay, and these aircraft were designated RB-47Bs. They were capable of daylight reconnaissance only. A total of 66 B-47Bs were also converted into TB-47B trainers, through the simple measures of adding a fourth seat for an instructor and removing the tail turret. These aircraft provided valuable crew training through most of the 1950s. With the introduction of the hydrogen bomb, the USAF contemplated the conversion of a few B-47Bs into MB-47B drones, which would essentially be huge cruise missiles carrying H-bombs. The program was known as "Brass Ring". Closer examination of the scheme showed that it was impractical, and Brass Ring was cancelled on the appropriate date of 1 April 1953. There were various flight tests through the 1950s for using the B-47B as a launcher for the big 31 ft (9.5 m) liquid-fueled AGM-63 Rascal missile, and one B-47B was modified to become a YDB-47B Rascal launcher. However, the Rascal program was politically problematic, and never became operational, though a total of 74 B-47Bs were modified into DB-74B Rascal launchers before the program got the axe. In 1953, two B-47Bs were modified for testing the probe-and-drogue refueling system. The tanker was given the designation KB-47G and was known as "Maw" by flightcrews, and was fitted with a British-built tanker kit. The refueling test aircraft was given the designation YB-47F and was known as "Paw", though other aircraft were also used as refueling targets. The program was cancelled in 1954 as it turned out the KB-47G simply could not carry enough fuel to make it a useful tanker. The idea of fielding B-47 tanker conversions came up again a few years later, but the economics didn't make sense, and the notion was finally put to rest for good in 1957. One of the most unusual B-47B conversions was the Canadair CL-52 which was a B-47B loaned in 1956 to the Royal Canadian Air Force to test the new, powerful Orenda Iroquois turbojet (rated at 19,250 lbf (85.6 kN) dry, 25,000 lbf (111 kN) afterburning) for the Avro Canada CF-105 Arrow interceptor. Canadair Aircraft, the sub-contractor, attached the Iroquois engine to the right side of the rear fuselage near the tail; due to the large exterior diameter of the engine, no other location was feasible. (external link to photo) Flying the CL-52 was reportedly a nightmare. After the Arrow project was cancelled in early 1959, the B-47B/CL-52, with about 35 hours of engine flight tests to its credit, was returned to the U.S. Some sources claimed it was bent out of shape by the tests, but in any case, it was subsequently scrapped. 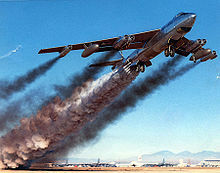 The CL-52 was the only B-47 to be used by any foreign service. Canadair CL-52 One of the most unusual B-47B conversions was the Canadair CL-52 which was a B-47B loaned in 1956 to the Royal Canadian Air Force to test the new, powerful Orenda Iroquois turbojet (rated at 19,250 lbf (85.6 kN) dry, 25,000 lbf (111 kN) afterburning) for the Avro Canada CF-105 Arrow interceptor. Canadair Aircraft, the sub-contractor, attached the Iroquois engine to the right side of the rear fuselage near the tail; due to the large exterior diameter of the engine, no other location was feasible. (external link to photo) Flying the CL-52 was reportedly a nightmare. After the Arrow project was cancelled in early 1959, the B-47B/CL-52, with about 35 hours of engine flight tests to its credit, was returned to the U.S. Some sources claimed it was bent out of shape by the tests, but in any case, it was subsequently scrapped. The CL-52 was the only B-47 to be used by any foreign service. A contract was signed with Boeing in January 1950, calling for rework of one aircraft. A B-47B-20-BW (s/n 50-082) was earmarked for the conversion. The date for first flight was projected as April 1951. The B-56 was cancelled in December 1952 before conversion of the prototype was started. XB-47D Beginning in 1951, two XB-47Ds were modified from B-47Bs as purely experimental platforms, with a big Wright YT49-W-1 turboprop engine spinning a huge four-paddle prop, replacing each of the inboard two-jet pods. Difficulties with engine development delayed first flight of the XB-47D until 26 August 1955. The aircraft's performance was comparable to that of a conventional B-47, and its reversible propellers shortened the landing roll, but the USAF did not follow up the idea. B-47E The designations B-47C and B-47D were applied to special variants that never went into production (described later), and so the next production version of the B-47 was the definitive B-47E. The first B-47E flew on 30 January 1953. Four "blocks" or "phases" of the B-47E were built, each incorporating refinements on the previous block, and also sometimes featuring production changes within a block. Older blocks were generally brought up to the specifications of later blocks as they were introduced. Early production "B-47E-Is" also known featured J47-GE-25 turbojets with 5,970 lbf (27 kN) thrust, but they were quickly changed to J47-GE-25A engines, which featured a significant improvement in the form of water-methanol injection. This was a scheme in which a water-methanol mix was dumped into the engines at takeoff, increasing mass flow and so temporarily kicking the thrust up to 7,200 lbf (32 kN). Methanol was apparently added to the water as an anti-freezing agent. The engines left a trail of black smoke behind them when water-methanol injection was on. Jet-Assisted Take Off or JATO modifications were performed on early B-47E-Is. They had the 18 built-in JATO bottles, and were quickly exchanged for an external, jettisonable "split V" or "horse collar" rack fitted under the rear fuselage. The rack carried 33 JATO bottles, in three rows of 11 bottles. The built-in JATO system was eliminated because of worries about having the JATO bottles so close to full fuel tanks, and in any case once the rocket bottles were exhausted they were just dead weight. The racks were expendable, and were dropped over specific range areas after takeoff. The internal fuel capacity of initial production B-47Es was cut to 14,627 gal (55,369 l) as a weight-saving measure. This was considered acceptable because of the use of the big external tanks and the fact that the USAF had refined mid-air refueling to the point where it could be relied upon as a standard practice. A total of 1,341 B-47Es were produced. 691 were built by Boeing, 386 were built by Lockheed, and 264 were built by Douglas. Most B-47Bs were rebuilt up to B-47E standards. They were given the designation of B-47B-II, though it appears that in practice they were simply called B-47Es. TEE TOWN B-47E In 1955, a number of B-47E-Is were fitted with external pods, one mounted on either side of the bomb bay, with each pod containing four AN/ALT-6B jammers. The pods were known as "Tee Town pods" (for Topeka, KS, location of Forbes AFB) and so these aircraft were known as "Tee Town B-47s". They retained their normal bombing capability. EB-47E The Tee Town B-47s then led to a specialized ECM conversion of the B-47E, which was given the designation EB-47E. The initial EB-47 conversion featured a set of 16 jammers in a removable cradle stored in the bomb bay, plus radar warning receivers and chaff dispensers. These were known as "Phase IV" or "Blue Cradle" EB-47Es. The more advanced "Phase V" EB-47E featured a pressurized module that was stowed in the bomb bay, with 13 jammers under control of two Crows. While the Phase IV jammer system was "broadband", blanketing a wide range of frequencies in hopes of jamming radars operating somewhere within that range, the Phase V jammer system could be selectively tuned to specific radar frequencies by the crows, permitting much higher jammer power on the frequencies that did the most good. A radar jammer tends to announce its presence and location by the radio signals it emits, and EB-47E crews were perfectly aware that they were unlikely to return from an operational mission into the USSR. If they could cover for B-47 bombers, however, the sacrifice would be worth it. About 40 B-47Es were converted to EB-47Es. Of course they couldn't carry bombs, but they did retain the tail turret. B-47E 52-0410 and 52-0412 were converted to EB-47Es in the mid-1960s for service with U.S. Navy's Fleet Electronic Warfare Support Group (FEWSG). Considered to be on indefinite loan from USAF, these aircraft were unlike the USAF EB-47Es, with some of their ECM gear fitted into pods carried on the external fuel tank pylons. They were used for tests of naval ECM systems and as "electronic aggressors" in naval and joint exercises. These two aircraft were the last B-47s in operational service, and 52-0410 performed the very last operational flight of a B-47 on 20 December 1977 when it was flown to Pease AFB, NH and put on display at the main gate. Following the closure/realignment of Pease AFB in 1991 and its conversion to Pease International Tradeport and Pease ANGB, this aircraft was disassembled and trucked to Ellsworth AFB, SD where it donated its nose and engines to RB-47H 53-4299, which is in the National Museum of the United States Air Force at Wright-Patterson AFB in Dayton, OH. Three B-47Es were converted to the highly specialized EB-47E(TT) "Tell Two" configuration to be used for "telemetry intelligence", picking up radio signals from Soviet missile tests and space launches. The Tell Two was the precursor to the RC-135S Rivet Ball and Cobra Ball. The EB-47E(TT)s featured a "Crow capsule" in the bomb bay loaded with the appropriate gear and two ECM operators (known as Crows), and also featured odd and distinctive antennas just below each side of the cockpit. All three of these aircraft were operated out of Turkey, and stayed in service until 1967. The antennas on the nose of the aircraft attracted a good deal of attention from base personnel, and crews made up imaginative stories about them, for example claiming they were part of a "return to fighter (RTF)" defensive system that would cause Soviet air-to-air missiles to loop back and shoot down their own launch fighters. In reality, they were specialized receiver antennas used for intercepting telemetry signals from Soviet space and missile launches. A total of 14 B-47Es were converted to QB-47E target drones in 1959 and 1960. These aircraft were radio-controlled, and included such interesting features as self-destruct charges and arresting gear to assist in landings. They also carried pods mounted on the external tank pylons to help in scoring weapons tests. Apparently most of the missiles fired on them were directed for a near-miss, but the QB-47Es were nonetheless eventually whittled down to two survivors that were retired in the early 1970s. On 20 August 1963, a QB-47 veered off course on its landing approach at Eglin Air Force Base and crash landed on a stretch of road that ran parallel to the runway. Two cars were crushed by the crash landing, killing two occupants, Robert W. Glass and Dr. Robert Bundy, and injuring a third, Dorothy Phillips. Mr. Glass and Dr. Bundy both worked for the Minnesota Honeywell Corporation at the time, a firm which had just completed flight tests on an inertia guidance sub-system for the X-20 Dyna-Soar project at the base. Mrs. Phillips was the wife of Master Sergeant James Phillips, a crew chief at the base. Mrs. Phillips was treated for moderate injuries and released later that day. Both vehicles were destroyed by fire. The QB-47 that crashed was used for Bomarc Missile Program tests, which normally operated from Eglin AFB Auxiliary Field Number Three (Duke Field), approximately 15 miles (24 km) north of the main base. The RB-47E could carry photoflash flares for night reconnaissance. Although the RB-47E could be refueled in flight, its fuel capacity was increased, to a total of 18,400 gal (70,000 liters). The navigator controlled the cameras, becoming a "navigator-photographer" instead of a "navigator-bombardier". Following the single WB-47B weather reconnaissance conversion, in the early 1960s 34 B-47Es were converted by Lockheed into WB-47Es for weather reconnaissance. These aircraft were stripped of combat gear, including the tail turret. They were fitted with cameras in the nose to take pictures of cloud formations, and carried a special meteorological instrument pod in the bomb bay. Initially assigned to the Air Weather Service of the Military Air Transport Service (MATS), they became part of the Military Airlift Command (MAC) when that organization was established. The last WB-47E was retired on 31 October 1969, and was the last B-47 in operational USAF service. The bomb bay was replaced by a pressurized compartment, which accommodated "electronic warfare officers (EWOs)", also known as "Crows" or "Ravens" (both being black birds, it was a reference to "black ops" meaning classified operations). There were three Crows on board the RB-47H, but only two on the ERB-47H. A distinctive bulged radome fairing replaced the bomb bay doors. The RB-47H / ERB-47H retained the tail turret, and were also fitted with jammers and chaff dispensers. The only easily recognizable difference in appearance between the RB-47H and ERB-47H was that the ERB-47H had a small but distinctive antenna fairing under the rounded nose. Operations of the RB-47H and ERB-47H were often classified Top Secret, with the 10 hour missions generally flown at night. When crews were asked what they were doing, they always answered that such information was classified. On inquiries on what the blunt black nose was for, they would sometimes reply that it was a bumper, used in in-flight refueling in case they nosed into the tanker. This reply was often believed. The final RB-47H to be retired from service was later pulled out of the "boneyard" and used for tests of avionics for the General Dynamics FB-111. This RB-47H was fitted with an F-111-style nose and flew into the early 1970s. It was not given any special designation. It is now on display at the Air Force Armament Museum at Eglin AFB, Florida, fitted with a bomber nose. The RB-47Ks were generally used for weather reconnaissance missions, carrying a load of eight "dropsonde" weather sensors that were released at various checkpoints along the aircraft's flight path. Data radioed back from the dropsondes was logged using equipment operated by the navigator. The RB-47Ks stayed in service until 1963. In 1963, the Air Force modified 35 B-47Es to carry a communications relay system. These aircraft were given the new designation of EB-47L, and were used to support U.S. flying command post aircraft in case of a nuclear attack on the US. The EB-47Ls only remained in service for a few years, as improved communications technologies quickly made them redundant. About 25 surviving airframes exist in museum collections worldwide. The B-47 is featured prominently in the 1955 film Strategic Air Command starring James Stewart. 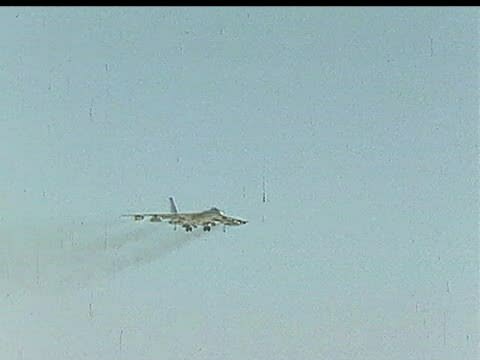 The film features good aerial footage of both the B-47 and the B-36. The majority of B-47 scenes were filmed at MacDill AFB, Florida utilizing aircraft from the 306th Bombardment Wing. The movie On the Threshold of Space (1956) has footage of a B-47 being used as a test ship in the development of a downward-firing ejection seat. The 1 July 1960 shoot down of an RB-47H (AF Ser. No. 53-4281) by a MiG-19 over the Barents Sea was retold by the two surviving crewmembers: Captain John R. McKone (navigator) and Capt Freeman B. Olmstead (co-pilot), in the biographical book, The Little Toy Dog by William L. White. The title refers to a small plastic toy "Snoopy" that Capt McKone carried with him, and kept during their seven months in Lubyanka prison in the Soviet Union. A one-hour episode of the TV series Kraft Suspense Theatre, "Streetcar, Do You Read Me?" (1965), starring Martin Milner, features extensive real footage, interior and exterior scenes, of the B-47E. The fictional story depicts a mission of the 307th Bomb Wing of the Strategic Air Command. Cook, William H. The Road to the 707: The Inside Story of Designing the 707. Bellevue, Washington: TYC Publishing, 1991. ISBN 0-9629605. Gunston, Bill. Bombers of the West. London: Ian Allan Ltd., 1973, pp. 126-153. ISBN 0-7110-0456-0. Knaack, Marcelle Size. Post-World War II Bombers, 1945-1973(PDF). Washington, DC: Office of Air Force History, 1988. ISBN 0-16-002260-6. Lloyd, Alwyn T. "Boeing's B-47 Stratojet". North Branch MN: Specialty Press, 2005. ISBN 978-1-58007-071-3. Peacock, Lindsay. "Stratojet...Progenitor of a Dynasty". Air Enthusiast, Thirty-eight, January-April 1989. Bromley, UK:FineScroll. ISSN 0143-5450. pp. 31-44, 63. Tegler, Jan. B-47 Stratojet: Boeing's Brilliant Bomber. New York: McGraw-Hill, 2000. ISBN 0-07135-567-7. Yenne, Bill. "Variant Briefing:Boeing B-47 Stratojet". International Air Power Review, Volume Six, Autumn/Fall 2002. Norwalk, Connecticut:AIRtime Publishing, 2002. ISBN 1-880588-46-3. ISSN 1473-9917. pp. 156-171.